With the new Star Wars movie being released today, I thought it would be fitting to introduce our class to their new teacher with the following video. Hope you enjoy! I just wanted to share with you all of a great learning opportunity that I couldn’t refuse for all the right reasons. As many of you know, I have a heart to reach out to our community of Chula Vista, being a former CVESD student, and of course my world travels to Kenya. With recent news about refugees and all the political debates happening, I started to ask myself “What can I do to make a difference to the individuals who need me the most?” The thoughts of my former childhood started to come to mind, because I was a “west side” kid in Chula Vista. I was the kid who was suspended five times at Hilltop Middle, and the kid who had a turnaround because of teachers who invested their heart into my life. With that said, I’ve decided to take a 6th grade position at Rice Elementary to start off the third quarter. The main question I can hear is, “Why now, Mr. Garcia?” With so much that I have invested into our school since the opening of 2013, I honestly can’t think of when it would be a good time to transition. Really, leaving at any time won’t be the easiest, but if one has dreams to make an impact then one should pursue those dreams and stay the course. I am working together with Mr. Hanks & Ms. Dugan in search of my replacement. We are confident that we will find a qualified teacher with a good amount of elementary education experience, energy, and dedication, so I have no doubt that your children will be well taken care of. This teacher will be ready to receive your children and work together with admin when school resumes on January 12th. Your children have all touched my heart greatly and I regret that I must leave them. I hope to have the opportunity to speak to each and every one of you personally before my transition comes into effect. I have appreciated working with each one of you as we strive to give your children the best education possible and thank you for your time and effort. I’d like to share with you the purpose of using Reading Glue Monday – Friday to monitor your child’s nightly 40 minute readings. 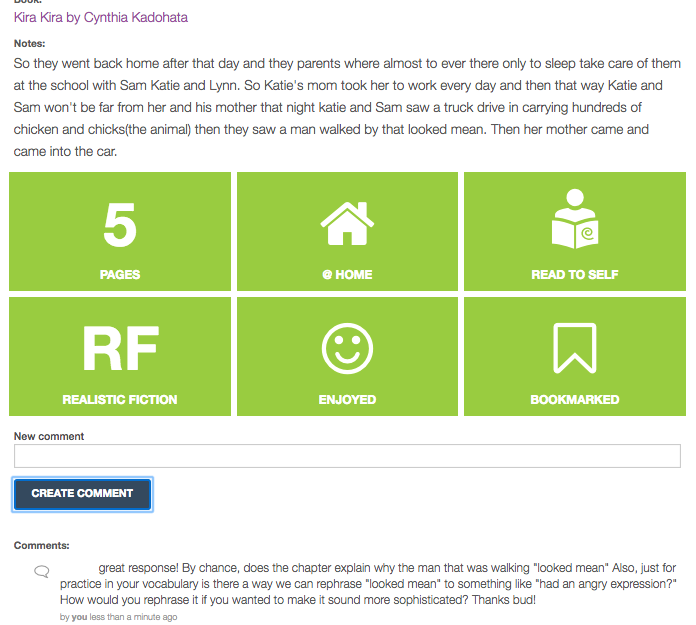 I’ve screenshot what Reading Glue looks like for me and a sample conversation I’m having with a student. As you can see, this conversation allows for a rich discussion in expanding vocabulary and really pushing your child to think more than what they’re reading. It allows them to really focus on their summaries and writing. In addition, it keeps them accountable to their nightly reflections and makes my life slightly easier (at least by not making copies and saving a few trees) to have a “Reading Conference” with them. One of the challenges that teachers face is monitoring the independent reading students do at home, and through this it allows me to teach beyond the school day and the classroom. Again, as concerned as you are about their nightly dinner also stay on top of their nightly reading. If you have any questions in regards to this program, please let me know. On Friday November 6th, our school will be hosting the first ever Fall Festival in lieu of the last two Winter Wonderland’s we’ve had in December. Every year a class chooses a themed gift basket to be auctioned off. 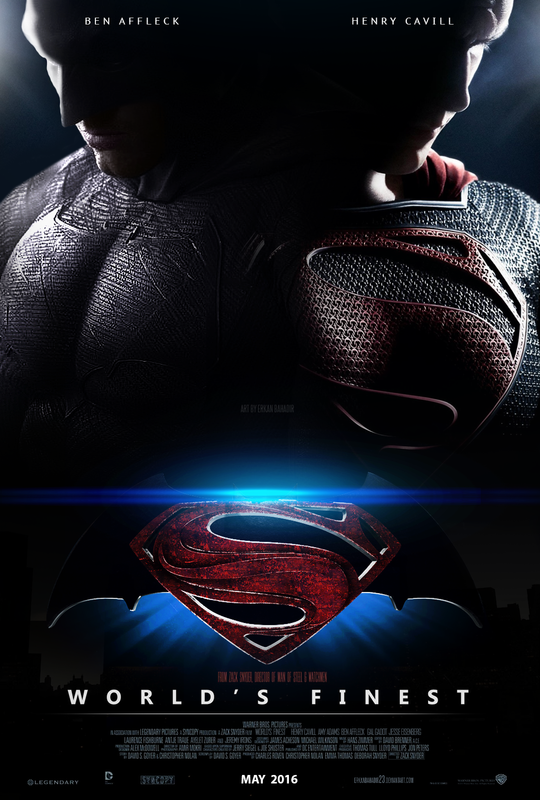 This year, our deadline is Thursday Oct. 29th for all donations to be turned in and our theme will be for the upcoming Batman v. Superman: Dawn of Justice movie to be released in May of 2016. This should be pretty easy, because I’m asking you to donate ANYTHING that has Batman or Superman. It can be toys, video games, coffee mugs, water bottles, journals, pencils, watches, DVD’s, Comic Books, Graphic Novels, etc. By donating one item, it allows our basket to be auctioned off at a great price that will allow definitely give the winner a deal for their money as well. Consider that PTA is one of the biggest supporters to our grade level, and we’ll need their help for several upcoming field trips and end of the year activities. 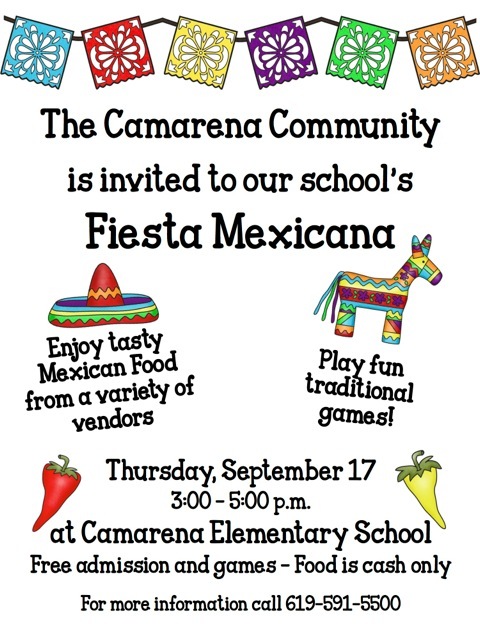 Hope to see all of you at our Fall Festival in a few weeks. 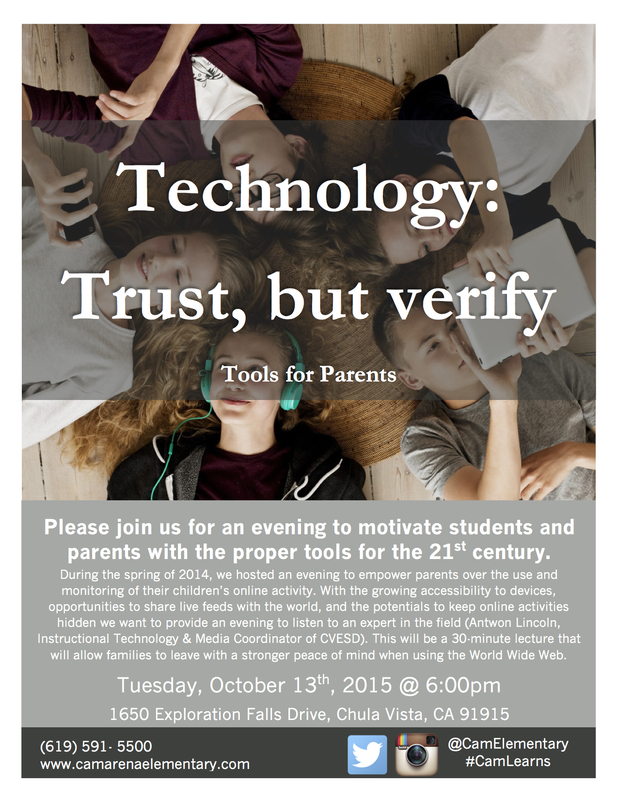 Parents and Camarena Community, please visit and help support our Social Media Awareness this coming Tuesday, October 13th, 2015 at 6:00pm. Looking forward to see you all there. Can you believe how fast this quarter has gone? At times I feel I just came back from Kenya, and now Fall is among us. I’m really excited to meet with all of you to plan, strategize, and get your child moving to the next level of their learning. We’ve been discussing the importance of taking ownership of our learning and realizing that it can be a struggle at times. However, taking those small baby steps towards progress is clearly evident, and I’m honored to share that work with you this week. Below is an attachment of our conference schedule. Please do not hesitate to contact me if you have any questions. It’s week five, and we are halfway until Fall break (looking forward to it, and hopefully cooler temperatures as well). If you haven’t signed up for the Fall Conferences, please do so by clicking here. 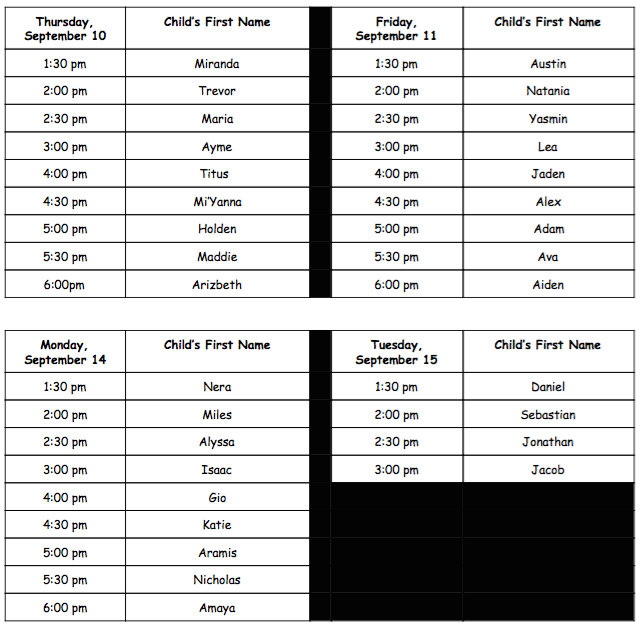 This coming Thursday, Aug 20th, we’ll be having picture day. 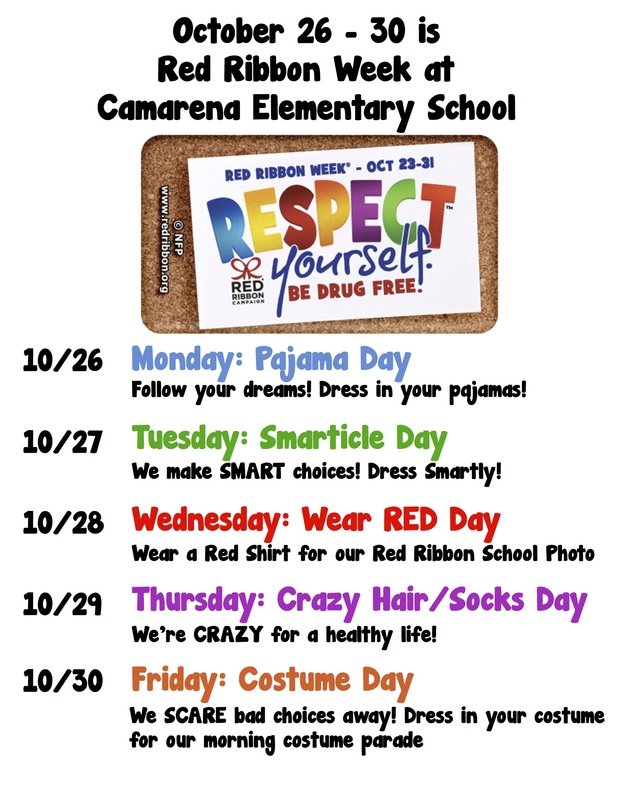 Please make sure your child is dressed up to their best because these photos will be used for the yearbook, as well as the end of the year profile slideshow that will take place at our promotion. I leave you with a little commercial about picture day. Monitoring Your Child’s Daily Behavior and Reading. I’m excited to meet and connect with you tomorrow evening at our Curriculum Night. We’ll cover a lot, and I hope to clarify any questions, and ultimately make our lives easier and efficient for the learning of our students. In that regard I would like to share with you about an email you received from the company Reading Glue. This reading program is meant to monitor the reading logs of your child. In addition, it will help me see where your child is at and how to challenge them to read higher leveled texts. The difference compared to how I’m using Google Classroom, TenMarks, and Kidblog with your child is that they need to use the email that was sent to you to log on. One thing I don’t want to do is overwhelm you with all these websites, apps, and resources. There’s only two websites that are clearly essential for the success of your child, and that is that you stay current with Class Dojo and Reading Glue. Everything else, I am able to manage and keep up with your child. The reason I’m asking that you keep up with Class Dojo and Reading Glue is because Class Dojo gives you a whole picture of how your child is doing during the school day. Reading Glue keeps your child accountable to their growth in their vocabulary, writing, and comprehension. Those the the most important elements that will allow your child to succeed this year. I’ll be glad to answer any questions, and guide your wonderings tomorrow at our Curriculum Night. Again, please talk to your child about signing on Reading Glue and completing their first response. I truly appreciate your support at the start of this year.